Nylon String vs. Steel String. Guitars come in a variety of shapes and sizes. Small children (ages 4-7) enjoy success with quarter-size or half-size guitars (approximately 32 inches long). Children between the ages of 8-11 need ¾-size guitars (36 inches). By the time they reach middle school, students may very well be ready for a full-size (but not jumbo-size) adult guitar (40+ inches). Acoustic guitars, both nylon and steel string, are easy to play, portable and often affordable. The natural resonance of the open wooden body of the instrument provides a natural, warm tone. You'd play an acoustic guitar in your family room, around a camp fire or at a coffee house. Acoustic guitars are usually the first choice for beginning students, and classical and folk musicians. Some acoustic guitars also have an amplification pickup (like my Takamine cutaway classical and Epiphone AJ series steel-string). They're called acoustic electrics. Quality guitars for young people can range in price from $60-120 (Lucida, Amigo) to $500+ (Baby Martin, Taylor). If you have an old family guitar, you may want to trade it in for a smaller model, or wait a few years before using it. If you bring it to your lesson, I can evaluate it. Electric guitars are usually solid body instruments which require accessories to be heard as intended. They have built-in pickups, so you can plug a cord into an amplifier and project sound electrically(I use a Fender tube amp and effects pedals with my Fender Telecaster). This favors loud, often distorted effects, such as wa-wa, fuzz, etc. Think Jimi Hendrix, Eric Clapton, Stevie Ray Vaughan. That's why young rock musicians are usually sent to practice in the garage. If your child is practicing with headphones, be aware of the dangers of loud decibels on young eardrums. Students fourth grade and up may play an electric guitar in their lessons; but, in consideration of others in the class, amplifiers are not used. Nylon string guitars have six strings and are the best choice for young fingers. Nylon strings are easier to play than steel strings, and are more appropriate for fingerpicking. Nylon is the modern day version of ancient cat gut material used in Spanish and classical guitars. Actually, only the top three strings are nylon and the bottom three are wound metal. The sound is more soft and mellow than that of a steel string acoustic guitar. Willie Nelson, Chet Atkins and Andres Segovia have all used fingerpicking techniques on nylon string guitars. The adult-size nylon-string, classical fretboard/fingerboard is normally wider than the steel string acoustic neck. Steel string guitars can have six or twelve steel strings. Often easier to keep in tune than nylon string guitars, they supply a ringing, brilliant sound. For young children (ages 4-8) steel string acoustics are often more difficult to play. Many guitarists (Neil Young, Bob Dylan, Paul Simon) opt for the calluses and choose a steel string. You can use a plastic pick for greater dexterity. Often strings can be reset closer to the fingerboard for easier playing. This is called "lowering the action." The music store can do this for you if necessary. Bring your child shopping with you. The most important thing is that he or she should be comfortable holding the guitar and pressing down on the strings. You are investing in a high quality instrument, not a toy. This will encourage joyful music making. Students normally change their guitar strings at least two or three times per year. Students are responsible to safeguard their own guitars. I'll tune up all guitar strings at the start of each class. Many of my students shop at Nashville Music Company on Hillsboro Pike in Green Hills. Call owner Dan Montgomery at 615-292-5651. 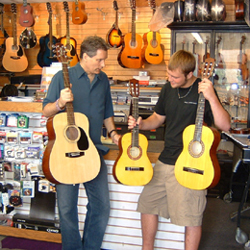 That's his son Nick, in the photo above, showing the children's Amigo guitars. You could also try Corner Music on 12th Avenue South (615-297-9559); Guitar Center in 100 Oaks (615-297-7770); or Shuff's Music in downtown Franklin (615-790-6139). Please call me at 615-383-8516 if you have any more questions. Happy strumming!